The insurance company tells me the repairs will be completed by the 9th July and the garage says next Wednesday. I’m hoping the garage is correct. We’re using the time to see the local sights. Livermore (Unplanned – Should have been Yosemite) 23rd ….Arse! About an hour into the drive and heading downhill at 65mph on a 4 lane Freeway I watched as a chunk of steel girder broke off the lorry in front of me. It looked small as it bounced towards me. It wasn’t. 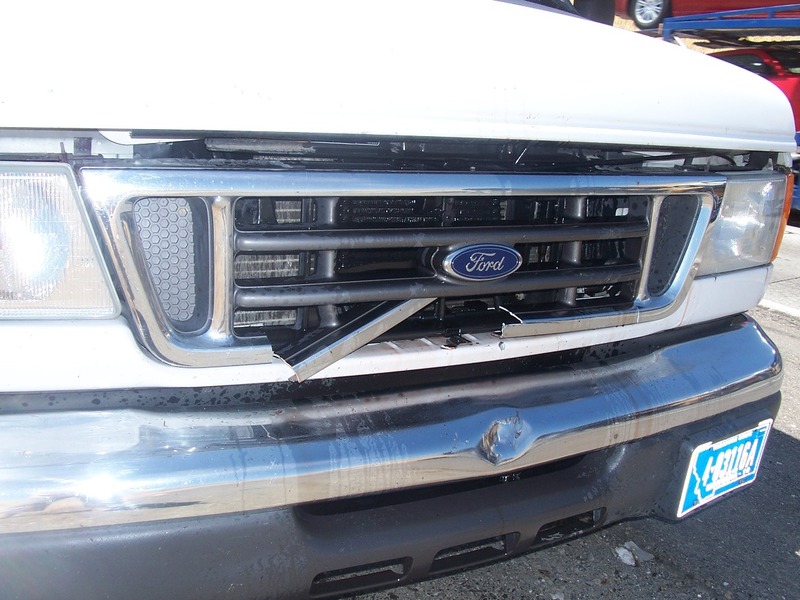 When I managed to pull into the shoulder it was still sticking out of the grill. It was about 5ft long and weighed about 4-5 stone. It took a lump out of the heavy steel bumper, punched a hole in the radiator & oil cooler and pushed the upper bulkhead back by about 2 inches (have you noticed how I’ve gone all imperial?). 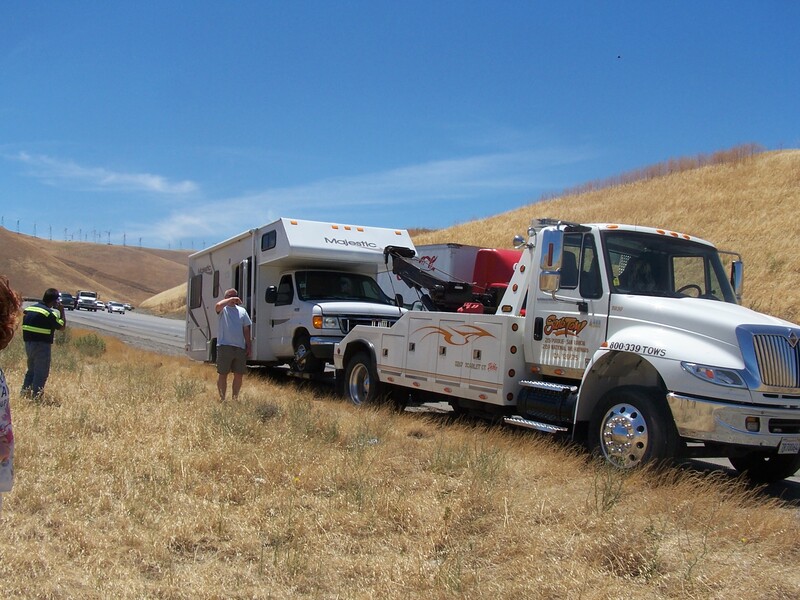 We had to get towed to Livermore and I’m now waiting to hear how long/much it will take to get us back on the road. On the positive side – none of us were hurt. One foot higher and it would have gone though the windscreen and probably out the other end. Crossed the Golden Gate Bridge heading out of SF. It was so covered in fog we couldn’t see the top of the bridge. 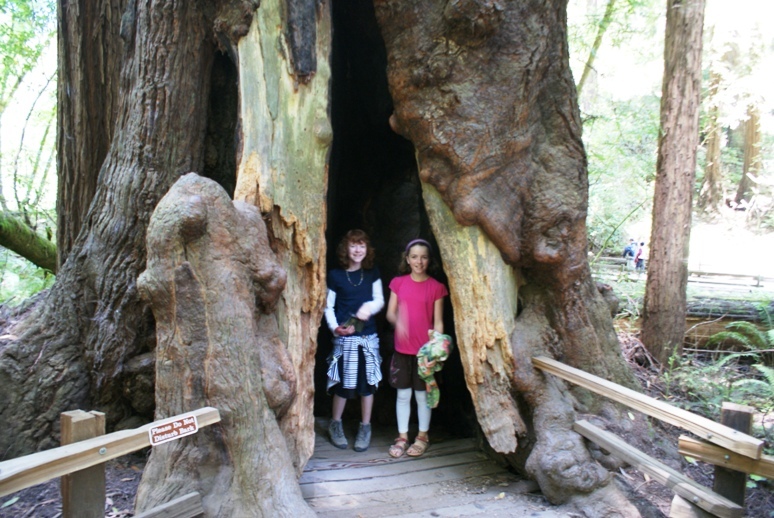 Stopped off at Muir Woods on the way to Sonoma to see the giant Red Wood trees. Beautiful, but needn’t have. 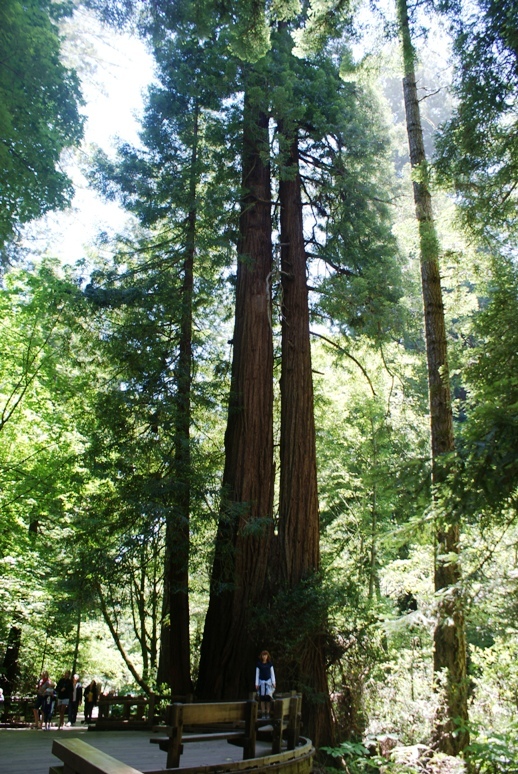 Our Sonoma campsite (in Sam Taylor State park) was full of Red Woods. 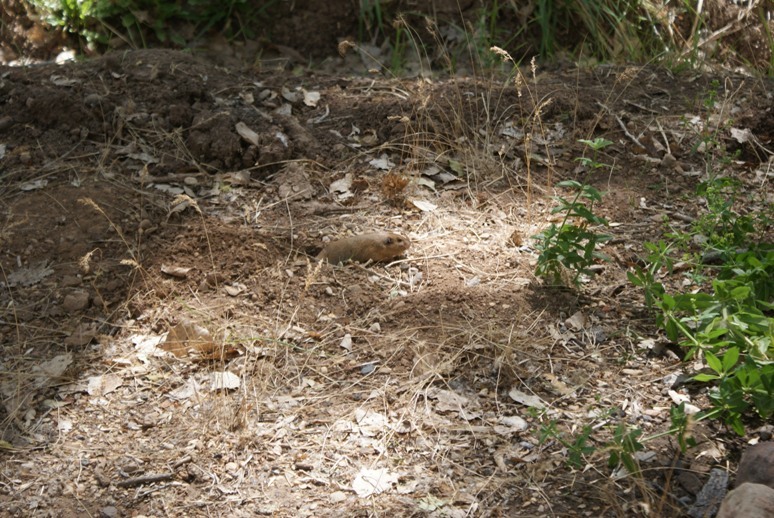 There was even one on our site which was big enough to get inside. 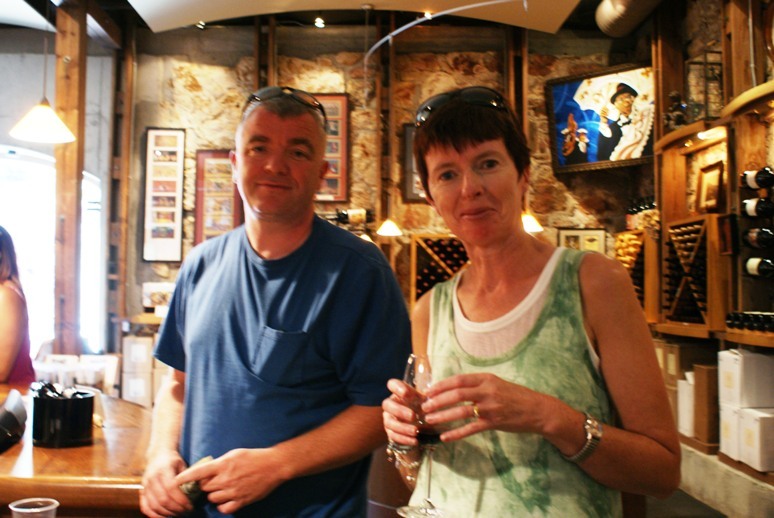 Spent the next day cruising the wineries, doing a bit of tasting and being seduced into buying wine. Finished the drive up route 1 along the coast. Beautiful scenery but bloody freezing. We’ve gone from having the A/C one for the last 4 months to having to put the heater on when we’re driving. The road was like a snake. Up, Down, Left, More Left then Right and with proper drops off the side. Very mind focusing. 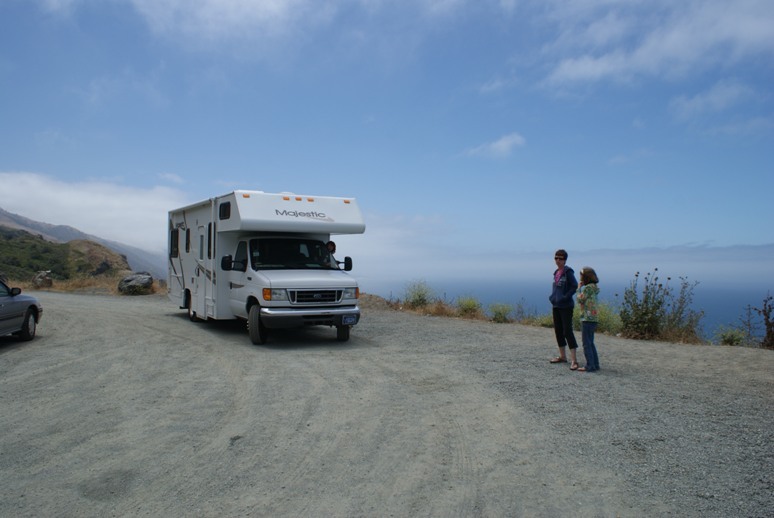 Pulled into the campsite in Pacifica city. Just a carpark on the pacific cliff coast with a tiny swimming pool in the middle. $200 for the 3 nights – Mickey taking. Probably could have got a hotel room for that. Up early next morning and drove to the nearest BART station (like DART except in the Bay as opposed to Dublin). Nice big carpark, $1/day and campers parked up. Damn! Bought 3 day public transport passes for $80. A bit expensive but cheaper than 2 one day passes. I tried to give them away when we were leaving but everyone in the train station but people kept avoiding me. I suspect they thought I was a weirdo or a beggar (10/10 for them). We found out that Alcatraz was booked up for all the days we were due to be in San Francisco. 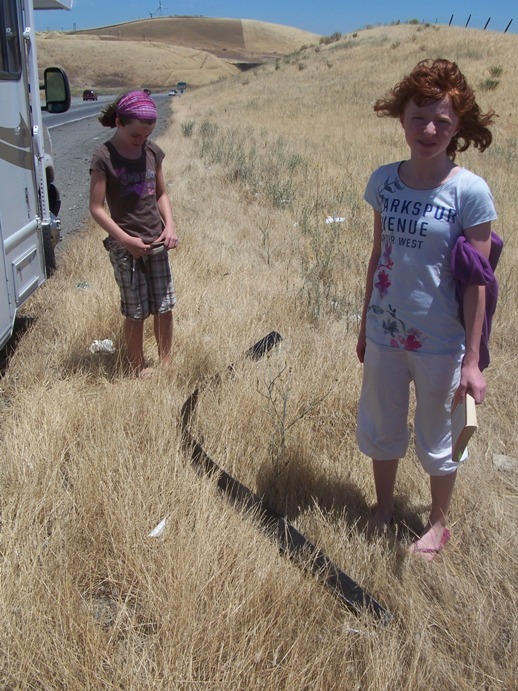 This was nobody’s fault, but I would point out that Susan only started looking at the Rough Guide as we pulled into the campsite. More time to see SF proper though. 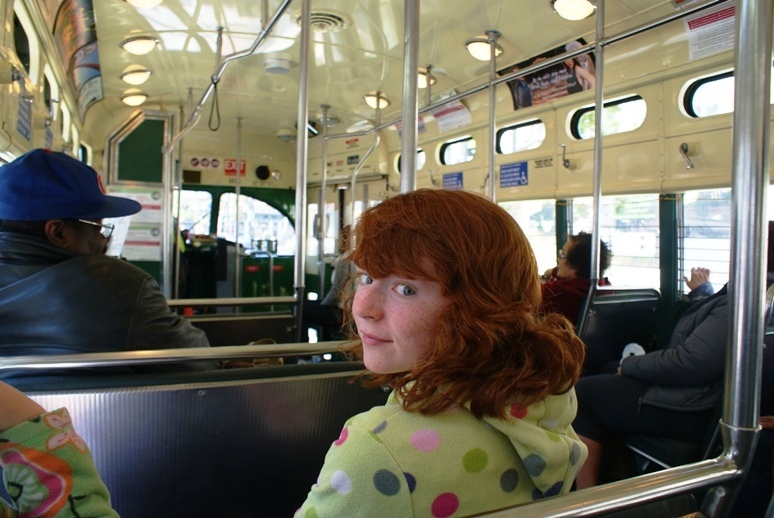 Did the trolleys, Haight Ashbury, Chinatown and the Golden Gate Park. Surprised at how difficult it was to find a decent restaurant in Chinatown. Haight Ashbury is still cool to walk around. The girls did some shopping and we ended up eating dinner in an Ethiopian restaurant. 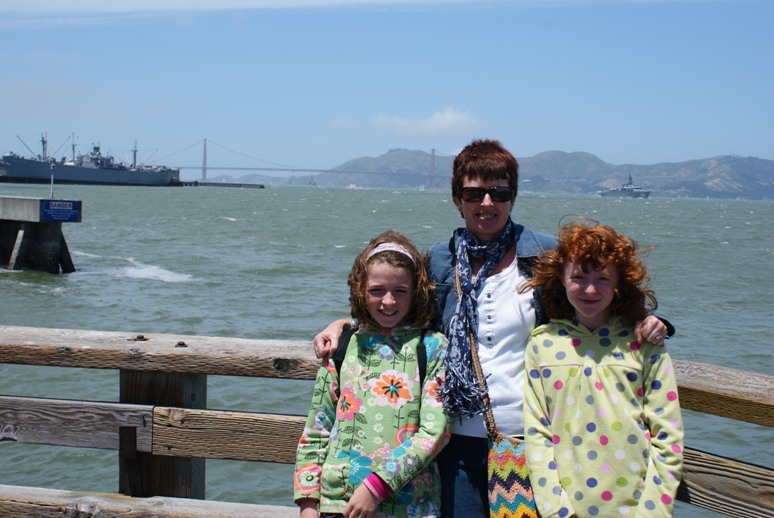 Golden Gate Bridge and the Girls. COLD! 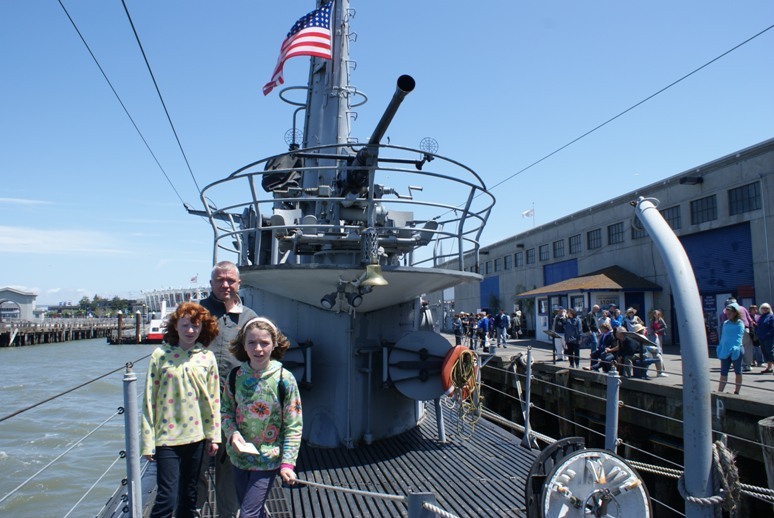 Visited a WW2 submarine. Susan loved it. Honest. Golden Gate bridge half hidden. Jane having a bad hair day. 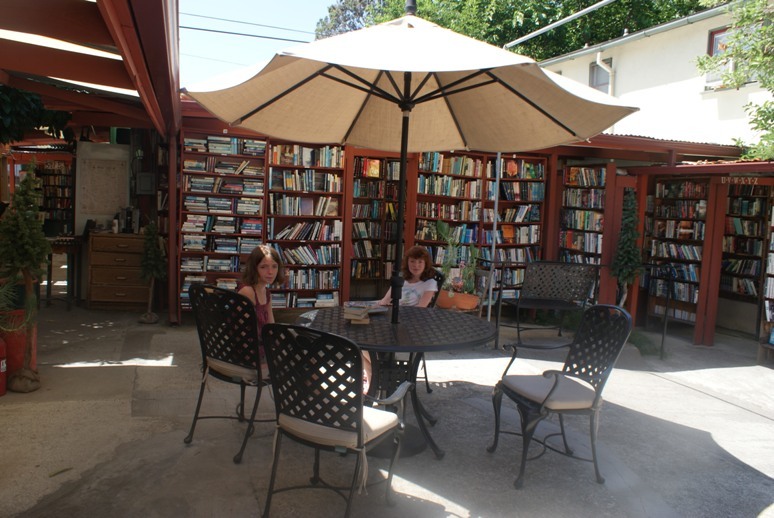 The previous night, having returned from Ojai, I spotted an ad for an outdoor bookshop selling new and secondhand books. It opens each day from 9.30 to sunset. I had to see it, so we headed back there the next morning. It was so nice and well worth a visit. It was really big, with garden furniture and plants dotted around, a diy coffee maker and friendly staff. They have canopies over the bookshelves to keep the rain off, but rain isn’t really an issue here. When we eventually tore ourselves away we headed for the coast. We just wanted to break our journey to San Francisco. This proved quite difficult. We had hoped to stay on the beach but the ranger advised us against it, as we didn’t have a 4×4 and it costs $300 to be dug out of the sand. On this occasion Ian took his advice but sorely regretted it, when, having paid $45 to stay in a big sprawling state campsite nearby, we later walked down to the beach and saw loads of campers parked up. As Ian pointed out, we did American Girl and single-handedly boosted the US economy. Emma was delighted with herself, now that the long awaited trip had been realised. The drive along Sunset Boulevard was an eye –opener. There were vendors along the way selling maps of the stars’ houses but we declined on that one. We had tried to book ahead into a campsite, but along the coast is very busy and it’s now holiday season, so we were doing a journey into the unknown. 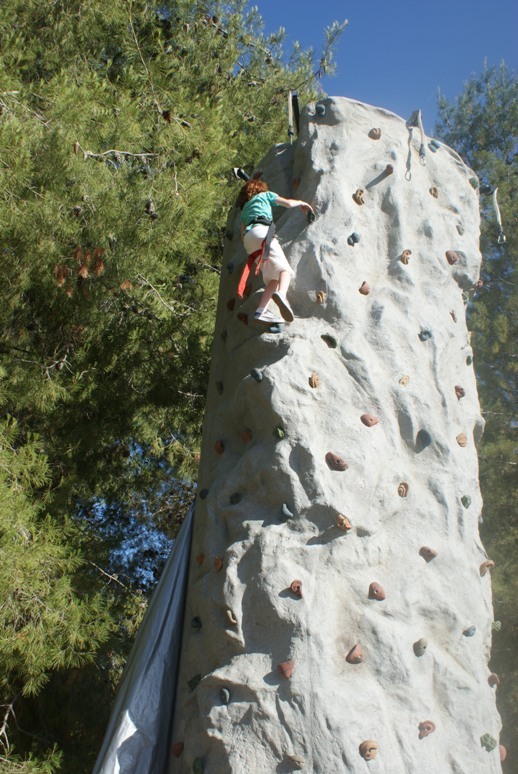 Luckily we found a really nice campsite, beside a state park, with a watering hole and a climbing wall thrown in for good measure. Decided to book in for three nights. Got a few jobs out of the way the next morning. Brought Emma to a lovely dentist in town. We thought she needed a filling but he assured us that it was a baby tooth that was on the way out. A lucky escape! Ian then caused a queue in the waiting room chatting to the dentist about our travels. Ian then went off to wash the van(an onerous task as it has to be done by hand), while Jane and I went off to get our hair done(the sun and swimming do terrible things to your hair).Anyway, we’re sorted for another while. 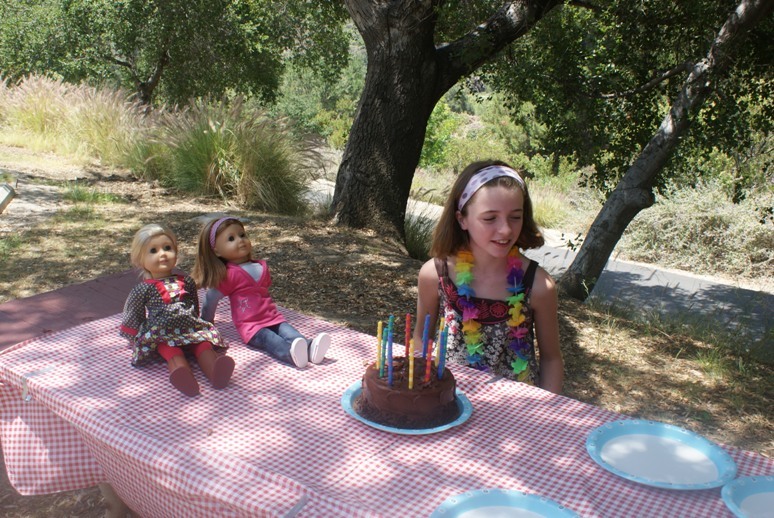 Wednesday was Emma’s birthday,11 today, when she was officially presented with her American Girl stuff. As soon as breakfast was over she was ready for her cake, Walmart’s best chocolate fudge cake (delicious), see the pictures. In the afternoon we visited a nearby town Ojai (pronounced Ohi, for those of you who watch Brothers and Sisters). It’s a lovely town, with pretty clapboard houses, lots of art and craft galleries, nice shops and restaurants. Ian’s comment every so often is “Susan, this is not a shopping holiday”. I suppose he has a point, but it can be very difficult, particularly when Emma is beside me saying “Go on, buy it”. We finished up the day in an Italian restaurant, sitting in a sunny courtyard, where a lovely Mexican girl sang Happy Birthday to Emma and gave her more gungy chocolate cake. She doesn’t have to live with her! A bit of agro re Disney. We were going to do a couple of days between the Disney Resort and California Adventure until we realised it would be the thick end of $600 just for the entry. 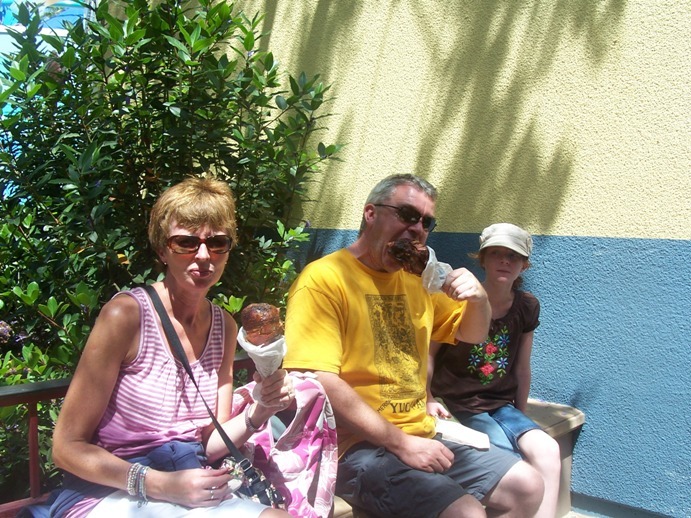 So we slimmed down to one day and just California Adventure as we’d done the resort 3-4 times before in Paris. This did not go down well with the troops but we finally got grudging agreement. I’ll let the girls tell you about Disney and tricking Susan into getting on the Vomit Comet. 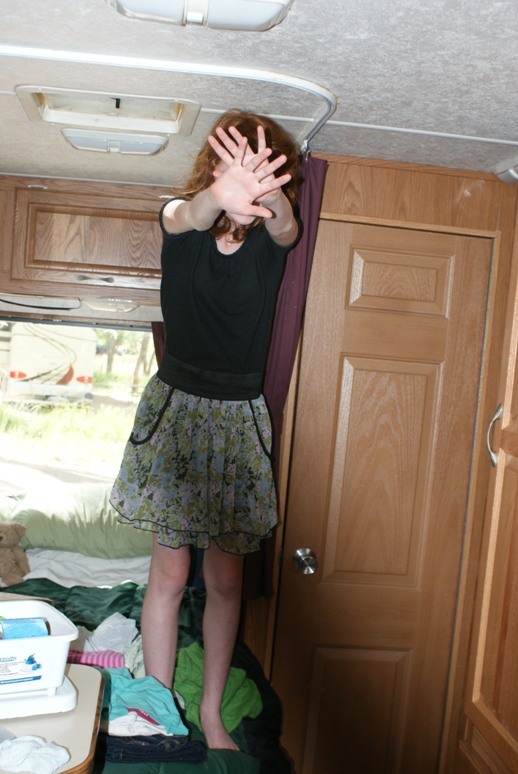 The camping in LA was a bit strange. The campsite was like a small housing estate with the roads but without the houses. You just parked up to a site but many of them still fronted onto the public road. Not too bad because it was a nice part of town. Next day we went to “AMERICAN GIRL”. Well when I say “we” I actually mean everyone but me. 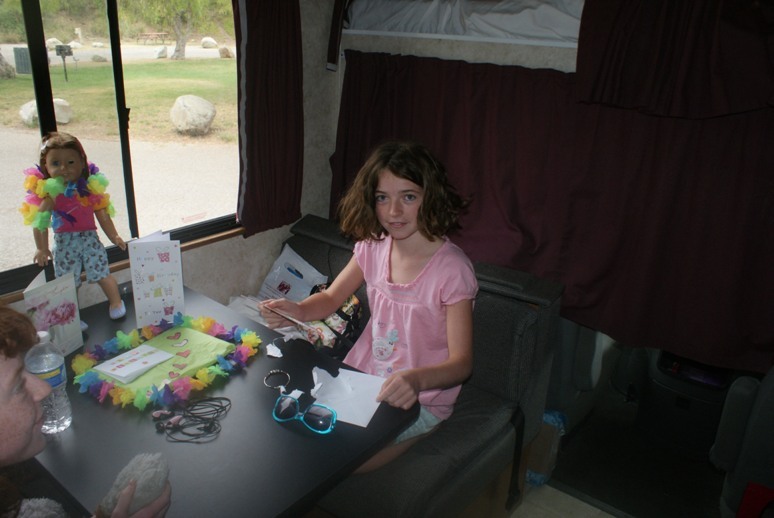 I was afraid the excitement would be bad for my heart so I stayed in the camper on the side of the street and read for a few hours. Bliss! Emma had an outrageous amount of money from her birthday (given two days early) going in and not a penny remaining when she left. Sean Shine told me once that he admired the American Girl business model – Now I get it. After American Girl I had the pleasure of conducting a driving tour through Beverley Hills (90210) and Sunset Boulevard. A few days ago we went to Disneyland. 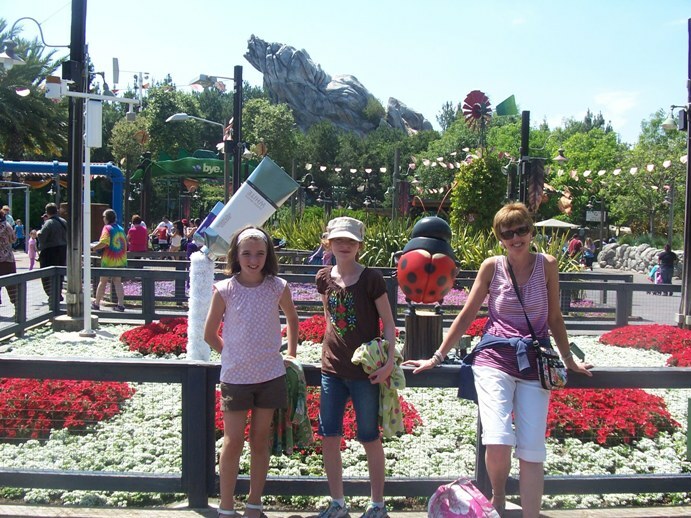 Emma had a giant hissy fit because she wanted to go to an exact replica of the theme park we’d been to several times before, while everyone else wanted to go to Disney‘s California Adventure, an alternative theme park no-one had been to before (guess which one we chose?). After getting over the initial shock of not being given what she wanted, Emma managed to drag herself to the bus stop while threatening not to come with us. Eventually (surprise, surprise), she came to see things our way. When we got there, we went on a river run sort of ride and got absolutely soaked. Mum and Emma queued for “World of Colour” tickets while Dad and I went on the Mali-boomer. It is one of those Hover-around-the-bottom-then-shoot-up-to-the-top-and-puke-your-guts-out rides. 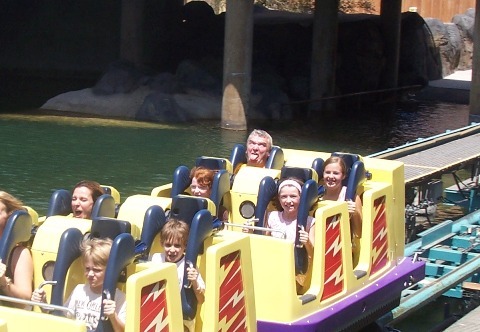 We convinced mum to go on this ride, but she said if we made her go on the California Sreamin’, she would do a big poo in her pants. These are Turkey legs – not Ice Pops. Drove to Death Valley straight from Las Vegas. 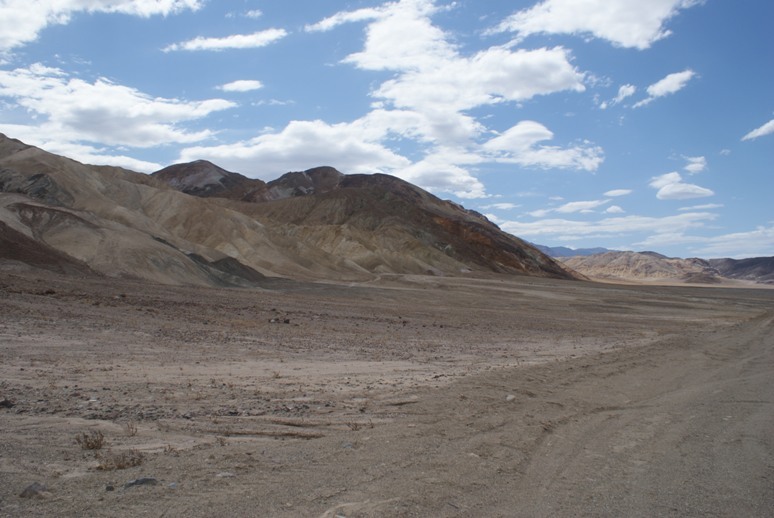 Most of the journey was through desolate and parched countryside with few others on the road. We did come over the crest of one hill only to see a cyclist struggling up the next incline. But that was about it. 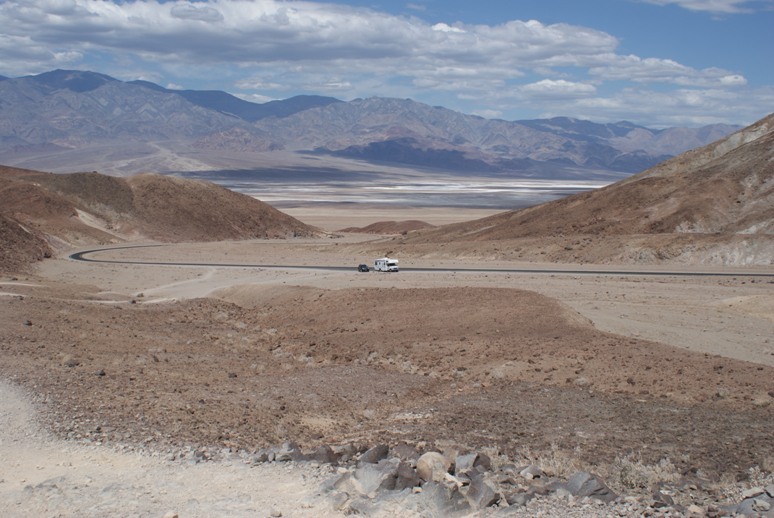 Nearly all of the Death Valley tourist facilities and campgrounds were closed because we were out of season. It seems most people choose to come here in the winter months. Hmm! Anyhow as we came over the last hill and dropped into Death Valley proper (196ft below sea level) we spotted a green area in the distance. This turned out to be Furnace Creek Ranch Resort. 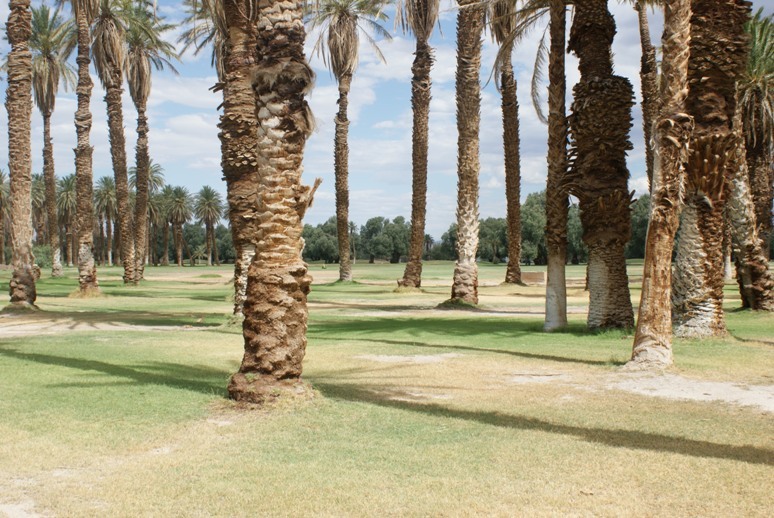 Grass, trees, swimming pool, campground and golf course in the middle of the valley – An amazing contrast. 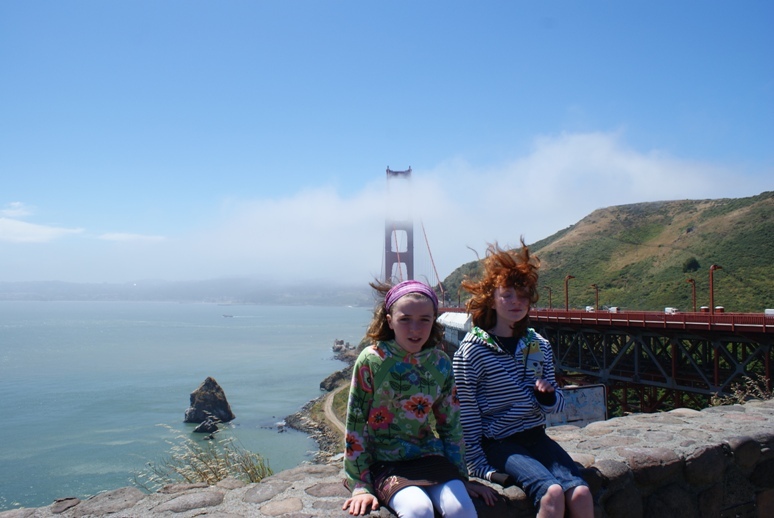 Funny thing is – it was windy and it didn’t feel that hot. Only 90f or so. We didn’t even leave the AC on. I went for a quick pint in the resort bar and met the crazy cyclist we’d seen earlier. He was from S. Korea and was almost finished an east to west coast cycle. Five minutes later 4 Americans turn up in cycle gear. They’re going from west to east. The world is mad. 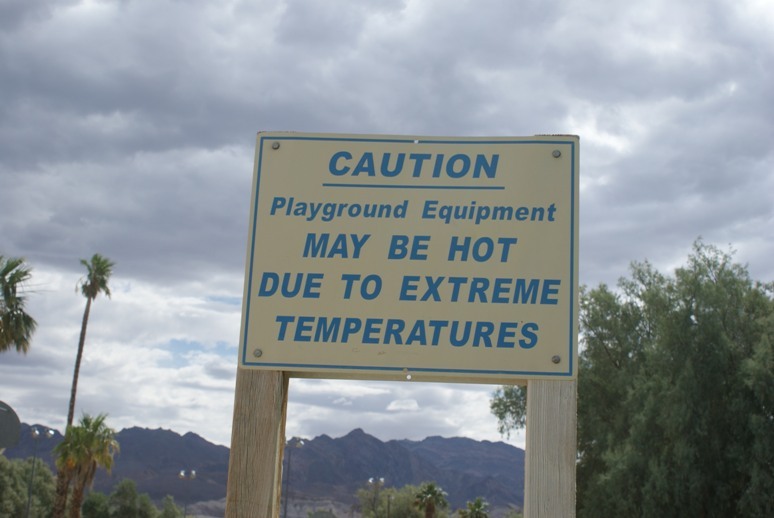 Except for the Furnace Creek Ranch Resort right in the middle of it. This place had a 1 Megawatt solar farm. Took a trip to Las Vegas, as you do. They don’t do campgrounds in Vegas, just hotels, lots of them. Las Vegas is big, brash and really tacky. Each hotel has theatres, shops and a full range of gambling options, poker, roulette tables and acres of gaming machines. We reckoned there was a conspiracy at work, once they got the punters in, don’t let them escape. All the hotels were like mazes, with no exits visible (apart from fire exits) and no glimmer of daylight to give you a clue. We did manage to find our way out eventually however (see Emma’s blog). 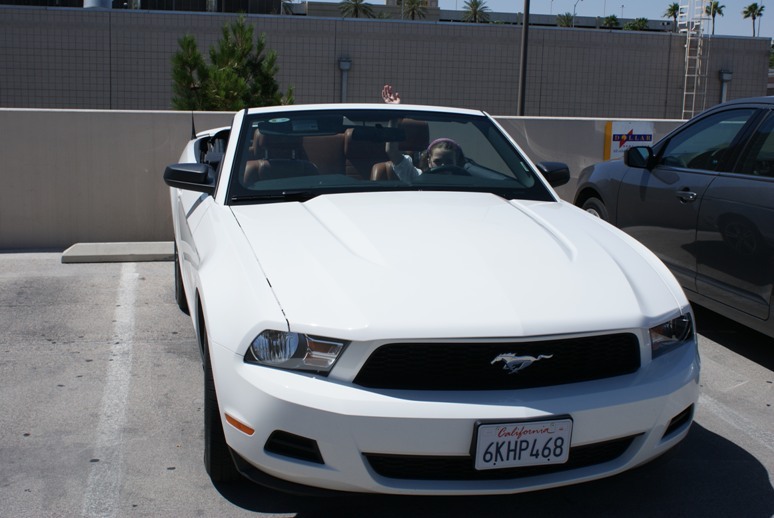 The following day we hired a car, not just any old car, but a Mustang convertible. 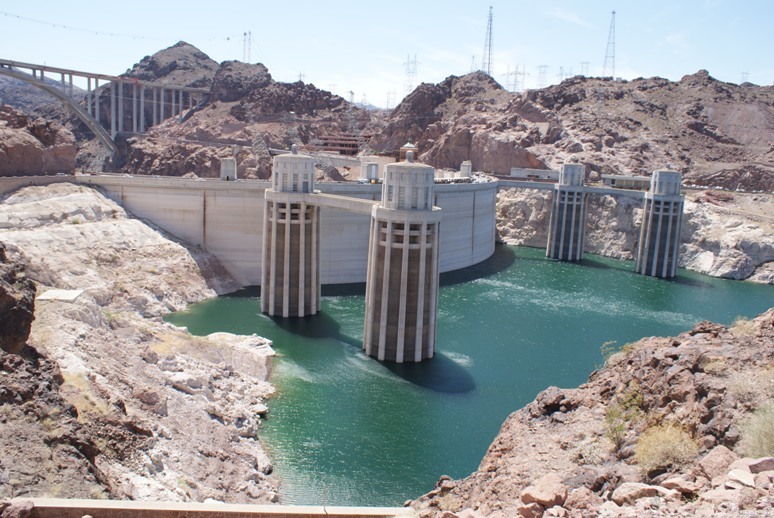 We visited Lake Mead and Hoover Dam, but it was so hot we had to keep the roof up. So much for the cool image. We made up for it that night though. We drove up and down the strip, Las Vegas Boulevard, to see the sights, with the roof down and the music blaring (everyone else was doing it). All you can see are hordes of people, hotel after hotel, neon lights flashing and music coming from all angles. 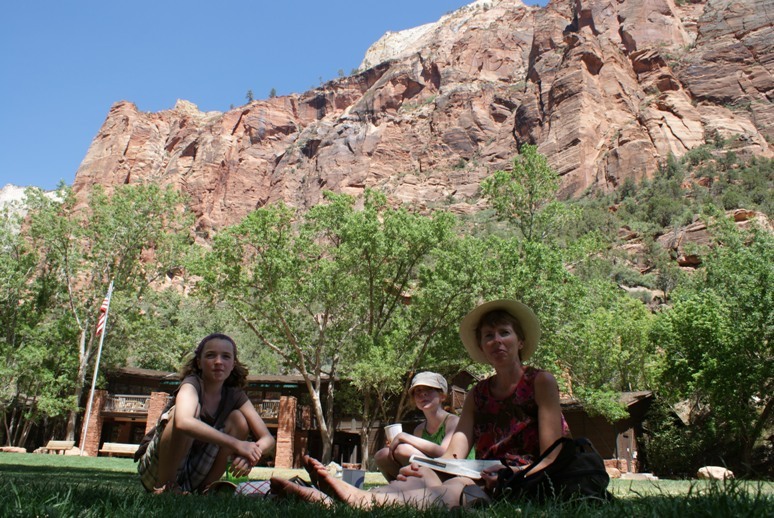 It was a real eye opener and a bit of a culture shock after our run of National Parks. Three days ago we arrived in Las Vegas. 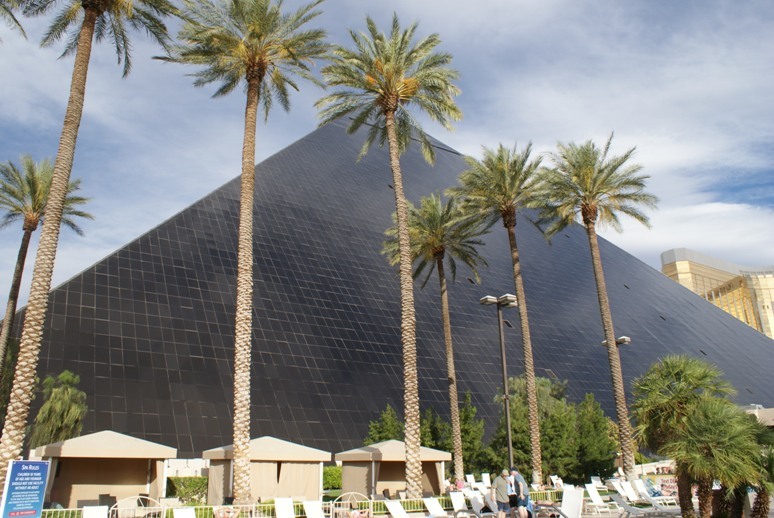 We were going to stay in a hotel called the Luxor. The building was the shape of a pyramid and completely made of windows. We couldn’t go to our room though because the check in time was 3:00pm and it was only 1:30pm so we left are bags with the Bell boy and went out to look at the city. But first we went to see if we could book tickets for KA but we couldn’t so we headed off. There was a free Tram service from hotel to hotel so we went on that and afterwards found out that it was quicker just to walk. Las Vegas is so tacky. We went to the MGM Grand to book our tickets for KA. In all the hotels there were Casinos. And all the hotels look like shopping centres. Then we went back to the hotel because it was 3:00pm. Our room was very nice and it had a Jacuzzi. Jane and I watched TV in the living room area and dad watched TV in the bedroom area while mum sat in the Jacuzzi and read her book. That day dad had bought new shoes and they were hurting his foot and he insisted mum got him his old shoes. When we looked out the window we could see a big swimming pool and we decided to find it. This was hard since there were no signs. Finally we found it. It was huge but only three feet deep. Mum said that it was because it made the lifeguard’s job easier. When we got back to the room we found dad lying on the bed watching Mad Max. That evening after we had all had showers we went to KA. We had half an hour to spare so we went for dinner first. But it had to be really quick. When we sat down in the theatre it took a while to start. It was amazing. When it was finished we left and went straight to bed. Etc. I could write them all day, but we all have to get on with our lives now, don’t we? Yesterday in the Rainforest café the waitress gave me a kid’s menu for 10 and under. Am I really that small? Apparently so. 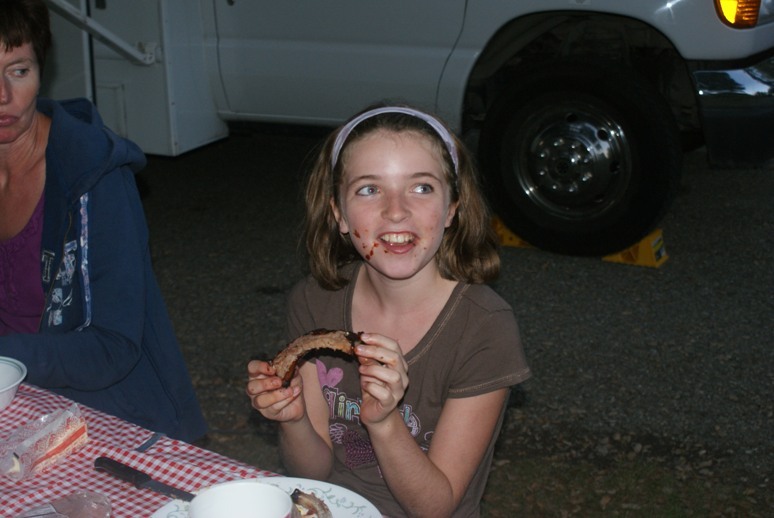 At Ka I was 12. (Ka is a Las Vegas show by Cirque du Soleil. Very cool! ), but only because the loss of a year could take $100 off the price. We were up with the birds this morning and on the road by 6.30am. The reason for this madness was that road works were beginning on the road leading into the park and delays of up to 3 hours were predicted. Avoided these and had a very pleasant drive through the Utah countryside. As we said before, there is no shortage of money here, so there are plenty of nice houses to ogle at, lush countryside and pretty towns, each one with the sheriff sitting in his car on duty (we caught one asleep on the job)! 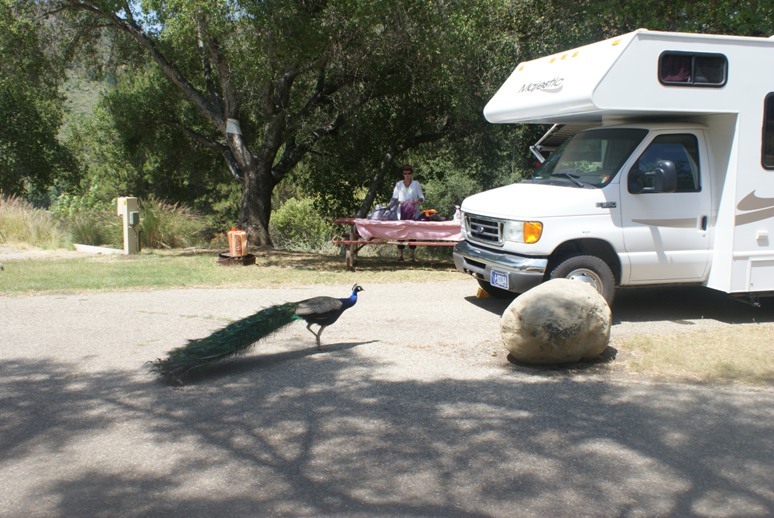 Were set up in our campground by 9am, and after breakfast headed off to the Visitor’s Centre. We had agreed that we weren’t doing anything too strenuous today, so opted for more moderate trails. 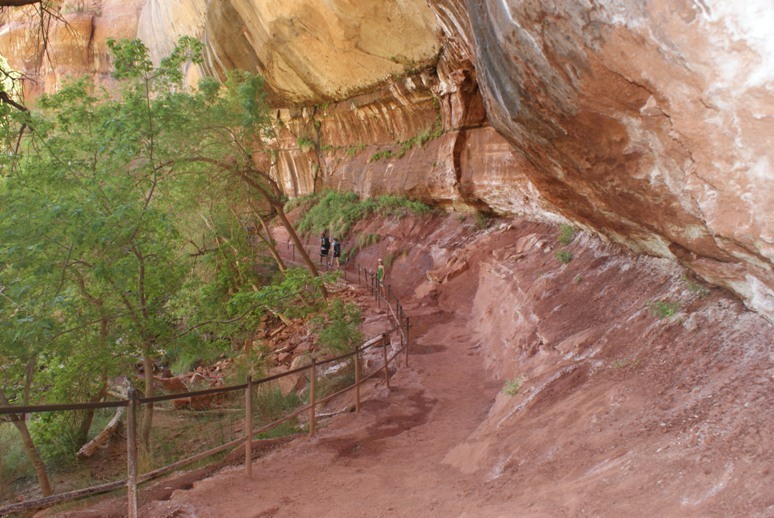 The Virgin River runs along the bottom of the canyon here, waterfalls and dripping springs flow down the cliff faces feeding the hanging gardens, so it is very picturesque. After our walk, we had lunch on the lawn (it sounds posh, it was burgers) and listened to a talk by one of the Park Rangers. We did another walk after lunch, and then chilled out. There were no fires lit that night, it’s much too hot for that. You are currently browsing the Grumpy and the Girls go to the Americas blog archives for June, 2010.